are © by Laura Orabone. – my god, this heat! Yuki Teikei lists in it spring. Haiku World (Higginson) lists it in summer. Safekeep copy in the library. are birds that comprise the family Trochilidae. They are among the smallest of birds, most species measuring in the 7.5–13 cm (3–5 in) range. Indeed, the smallest extant bird species is a hummingbird, the 5-cm Bee Hummingbird. The Aztec god Huitzilopochtli is often depicted as a hummingbird. Trinidad and Tobago is known as "The land of the hummingbird," and a hummingbird can be seen on that nation's coat of arms and 1-cent coin as well as its national airline, Caribbean Airlines. of the mountain camp . 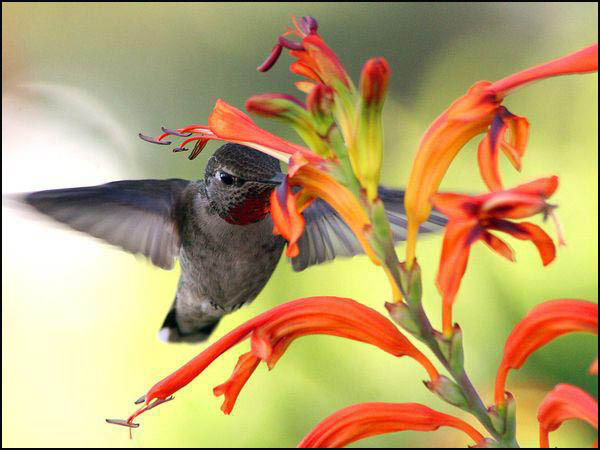 . .
to hummingbirds and bees ? Here in Tucson, Arizona it is a gray overcast day. 62 degrees fahrenheit... wonderful walking weather. One of them gave three short bursts while I was by the feeder that sounded like someone making a "tsk,tsk,tsk" sound through his teeth. Thankd for your contribution, dear anonymous friend!